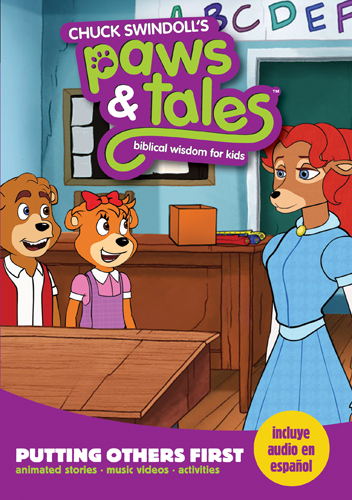 This DVD features two brand new episodes from the Paws and Tales animated series. In the first episode C.J. and Staci learn the value of helping others in need even if doing so interrupts our plans. The second episode teaches C.J. that even when those in power seem to hold all the cards, talking to our Father can bring everything back into balance. The lesson in the first episode seems a lot clearer than the second, but both are good stories that teach children right from wrong according to godly principles. Overall, I really enjoyed watching these two stories with my son, who is two. The concepts may have been above his head, right now, but the story certainly kept his attention, and but soon he’ll be able to apply these lessons to his own life. If I had to look for things to critique, there would be two main areas: quality and scripturally. The quality was not at all comparable to other titles available, secular or Christian. The animation is stiff. Chuck Swindoll’s glasses and outfits sometimes reflect the green screen behind him, so at times parts of him disappear into the computer generated background. The songs in the extra features are catchy, but the videos are just clips from the episodes haphazardly edited together without any context to the words of the songs. And finally, the DVD case is pretty Plane Jane. The other area I thought was lacking was that there wasn’t a lot of scripture to cement the lessons being taught. Maybe Chuck Swindoll could have done some easy teaching at the end to show why these things are important from God’s perspective, or at least a memory verse a la Veggie Tales. Overall though, they were fun stories and would be worth picking up if you’re shopping for some children’s programming with a good message. I received a copy free from the publisher. All opinions are my own. I really liked your blog my brother! The suggestions are very good. I have two grandchildren and I would like to buy for them. Only that I am brazilian and i live in Brazil, will encounter in portuguese? I'M Already following your blog. This DVD only has Spanish as an alternative language, but I'll keep my eyes out for Portuguese options.